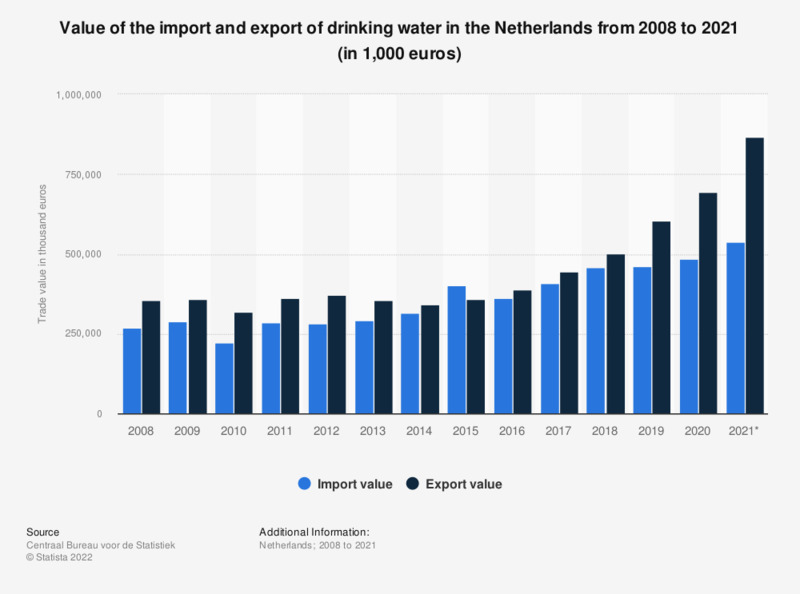 This statistic displays the value of the import and export of drinking water to and from the Netherlands from 2008 to 2017 (in thousand euros). It shows that in 2017, with a value of approximately 493 million euros, the value of the export was higher than the value of the import. The source explains that import value includes shipping costs and insurance costs to the Dutch border (in the case of EU imports) or the EU border (in the case of non-EU imports). Imports include all goods imported for use or consumption in the Netherlands over which national taxes and import levies are paid. This includes temporarily imported goods of non-residents processed under contract in the Netherlands, goods imported from non-EU countries entering the Netherlands via warehouses and re-exports. The source adds that export value includes shipping costs and insurance costs to the Dutch border. Exports include goods manufactured in the Netherlands and re-exports and temporarily exported goods of residents processed under contract abroad. This category includes mineral water (carbonated and non-carbonated), water containing added sugar or other sweeteners and flavoured water. Everything On "Non-alcoholic beverages market in the Netherlands" in One Document: Edited and Divided into Handy Chapters. Including Detailed References. Statistics on "Non-alcoholic beverages market in the Netherlands"
Do you consider alcohol-free beer just as tasty as beer with alcohol?